Put a sign on any horizontal surface: countertop, shelf, dispenser, cash register, etc. Sign feet can be permanently mounted, temporarily attached, or free standing. Chose the size and style of mount to fit your sign and location. 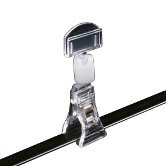 The 1” wide sign foot is ideal for use in areas where counter or shelf space is limited. Peel-and-stick permanent foam tape on the bottom of the base keeps signs from tipping. 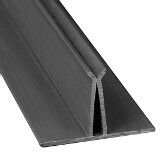 Available in two types: thin for signs up to 1/16" thick, and thick for signs up to 3/16" thick. Sold in 3" and 6" lengths. 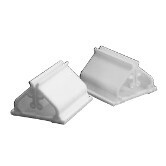 The 2” sign foot is a heavy-duty support for thick sign stocks such as foam core. It accepts stock up to 0.193" thick. The wide base prevents the sign from tipping. The base can also be secured with double-sided tape, magnetic tape, etc. This extra-wide sign foot is a heavy-duty support for thick sign stocks such as foam core. It accepts stock up to 3/16” thick. 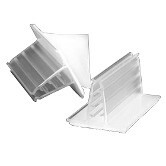 The extra-wide base prevents stock from tipping. It can also be attached with foam tape, magnet tape, etc. 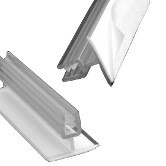 Finned sign feet have a straight-sided profile and grip stock up to 0.085 thick. Downward titled fins on the inside of the sign foot create an extra-secure grip on the sign. Available with a narrow base for use in areas where counter or shelf space is limited, and a medium base for more normal applications. Peel-and-stick permanent foam tape on the bottom of the base keeps the sign from tipping. Sold in 1" and 3" lengths. 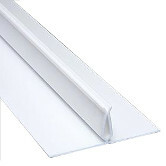 The 3" medium width is also available with removable adhesive. The heavy-duty finned sign foot grips stock from 3/16” to 1/4” thick. Downward titled fins on the inside of the sign foot create an extra-secure grip on signs, A wide base with either permanent or removable peel-and-stick foam tape keeps signs from tipping. Sold in 3", 6", and 49" lengths. The 3" and 49" are available with removable adhesive. The flexi grip sign foot has downward titled fins on the inside of the sign foot for an extra-secure grip on the sign. A flexible point between the base and the sign grip allows signs to bend out of the way, a feature that protects signs from being damaged and is helpful when restocking product. The base of this sign foot has pre-mounted foam tape with a permanent adhesive for extra resistance to damage. 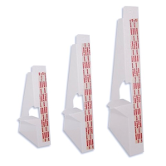 This small sign holder accepts stock in thicknesses from 15 up to 60 point. It is available both with and without foam tape on the base. With a very small “footprint”, the mini card holder is ideal for use in areas where space to mount a sign is limited. Tube grip sign holders snap easily onto tubes such as bicycle and lawn mower handles. 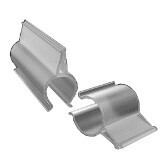 Two sizes of sign holders grip tubes from to 3/4” to 1" in diameter and hold sign stock up to 0.125" thick. Use these squeeze-clip sign holders to attach call-out cards and small signs to a variety of hard-to-mount retail surfaces such as: wire racks, textiles, metal shelving, product dividers, or to existing signs. Available in two sizes. Use a double squeeze-clip holder to attach promotional signs of varying thickness to hard-to-mount retail surfaces such as: metal shelving, wire baskets, textiles, product dividers or to existing signs. 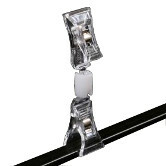 They can also be used to hang a variety of small items from anything that you can clamp to. Available in two sizes. These 5" easel backs convert any sign, photo, or other mounted material into a stand-up display. They come with an adhesive strip that stick to coated or uncoated paper, chipboard, vinyl, foamcore — almost anything you might want to use. These 7" easel backs convert any sign, photo, or other mounted material into a stand-up display. They come with an adhesive strip that stick to coated or uncoated paper, chipboard, vinyl, foamcore — almost anything you might want to use. These 10" easel backs convert any sign, photo, or other mounted material into a stand-up display. They come with an adhesive strip that stick to coated or uncoated paper, chipboard, vinyl, foamcore — almost anything you might want to use. 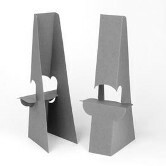 These 6" double-wing easel backs are made of plain chipboard with or without foam tape applied. The easel backs ship flat and assemble quickly by simply folding the locking tab into position. Optional peel-and-stick foam tape makes completing your counter top display even faster. 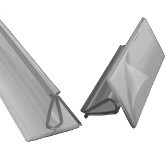 These 9" double-wing easel backs are made of plain chipboard with or without foam tape applied. 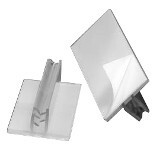 The easel backs ship flat and assemble quickly by simply folding the locking tab into position. Optional peel-and-stick foam tape makes completing your counter top display even faster. These 12" double-wing easel backs are made of plain chipboard with or without foam tape applied. The easel backs ship flat and assemble quickly by simply folding the locking tab into position. Optional peel-and-stick foam tape makes completing your counter top display even faster. These 15" double-wing easel backs are made of plain chipboard with or without foam tape applied. The easel backs ship flat and assemble quickly by simply folding the locking tab into position. Optional peel-and-stick foam tape makes completing your counter top display even faster.